The latest Mac OS X is now just OS X. The "Mac" is now gone. It's a clear declaration of intentions. 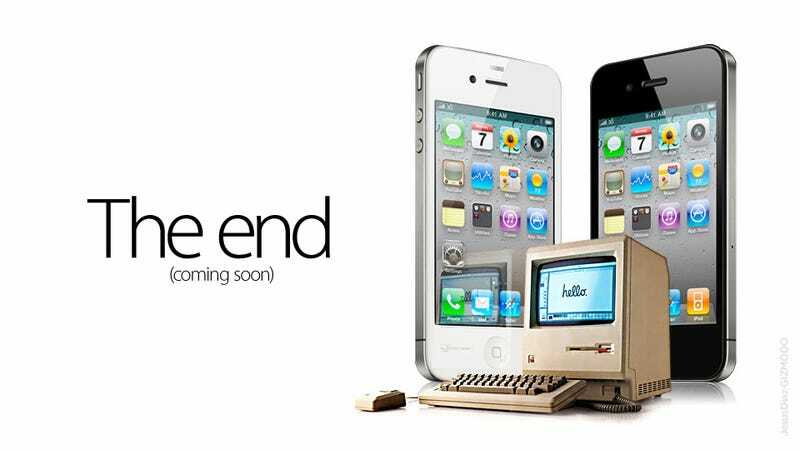 The end of Macintosh—the desktop metaphor that reigned supreme for more than two decades—is near. Not the MacBooks and the iMacs, no, but what defines them. Their software soul. Two more years and it will be nothing but compost under the flowers of iOS. Yes, yes, I know. "Outrage!" "Bring out the tar and the feathers!" "Burn him!" The fact is that it's happening. Apple is doing it, using an app-centric user experience model, and Microsoft is doing it too, with their information-centric Metro interface. The latter will take over Windows just like iOS is taking over OS X. Yes, Microsoft is killing the desktop metaphor it copied from Apple too. This process started when Apple realized the success of the iPhone was unstoppable. That people just loved this new way of computing that required no files, that you could touch and manipulate naturally. It continued with the iPad, which has become more than just a content-consumption platform—taking over the enterprise and breaking into many types of content creation. And yes, I hate to tell you I told you so, but I told you so. It's going to continue with Mountain Lion and the new MacBook Pro 2012s. Updated: Cook himself clearly hinted at this talking to the Wall Street Journal yesterday, when he said that, while laptops and tablets will continue to coexists, the technologies could converge further. Think about that. Thirty million more units in one year compared to the whole, nearly three-decade history of a product. Even taking into account the obvious expansion of computing during almost three decades, the amount is staggering. This is why Apple is making so much money. And why Microsoft is attacking back with Metro. Their user experiences will be different, but at the core of it is a database-driven world in which the user's data—songs, videos, documents, plans, game scores, social identities—are in a soup accessible through all their devices. For Apple users, their information is accessible from apps which are mostly isolated. For Microsoft users, there's a single sea of information that can be navigated in many different ways. The latter is potentially more powerful than Apple's approach, but that's the subject for another article. The important thing is that the Finder and the Explorer are on their way out, that the desktop metaphor is about to die. I know that some people are afraid about this change. They come out with excuses like "I want control of my files!" Or "professionals can't use this!" The truth is that they don't realize they have changed already. I remember the debate about digital music. For the first few years, people hated the idea of a program like iTunes using a database to manage their music. They wanted to manually manage files and folders! How amazingly stupid that idea was? How can you manage music or pictures or videos or anything—in this age of tens of thousands of objects and resources living in your hard drives and the Internet—without a database? Wanting to do that is as moronic as those who in the first days of the desktop metaphor wanted to keep using a command line. This, the death of the desktop metaphor, is just the last step of getting rid of an antiquated way to manage our information. Good riddance. Because it was never designed to support the gigantic amount of information that we have to deal with every day. We've changed. Our information has changed. The Mac, the desktop—has to die.